Here at the Jindy Inn we are members of L.A.O.K.O. 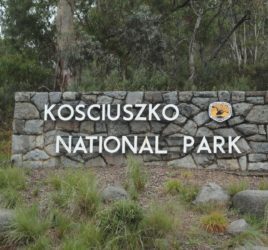 (Looking After Our Kosciuszko Orphans), a wildlife rescue group made up of a group of trained volunteer carers who assist in the rescue and care of native wildlife in The Snowy Mountains area. 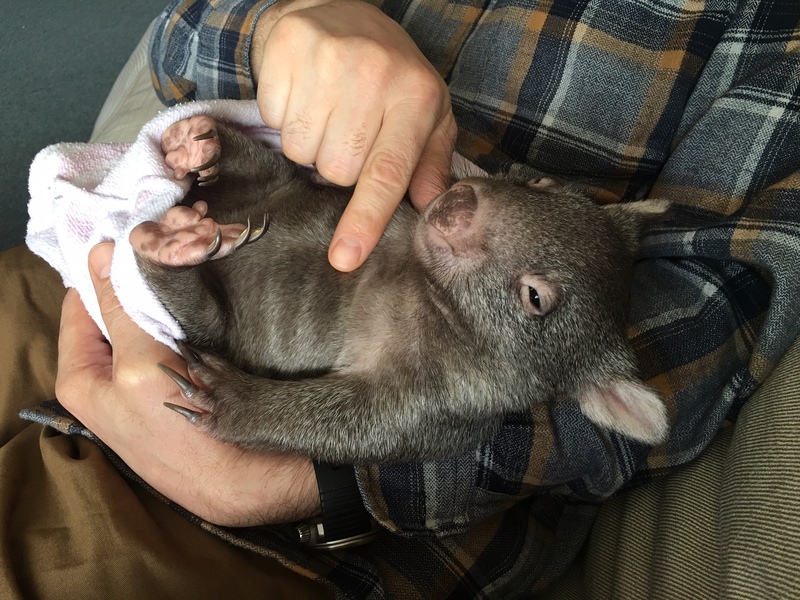 Each year hundreds of native animals are injured or killed as a result of car accidents, dog attacks and human intervention in the form of unauthorised culling. Both members and donations from the public help give these animals a second chance. Eric and I have been part of L.A.O.K.O. 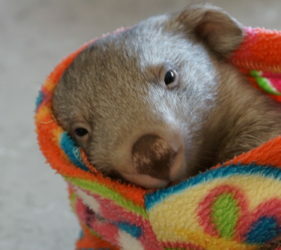 for 2 years and have been caring for orphaned wombats in that time. 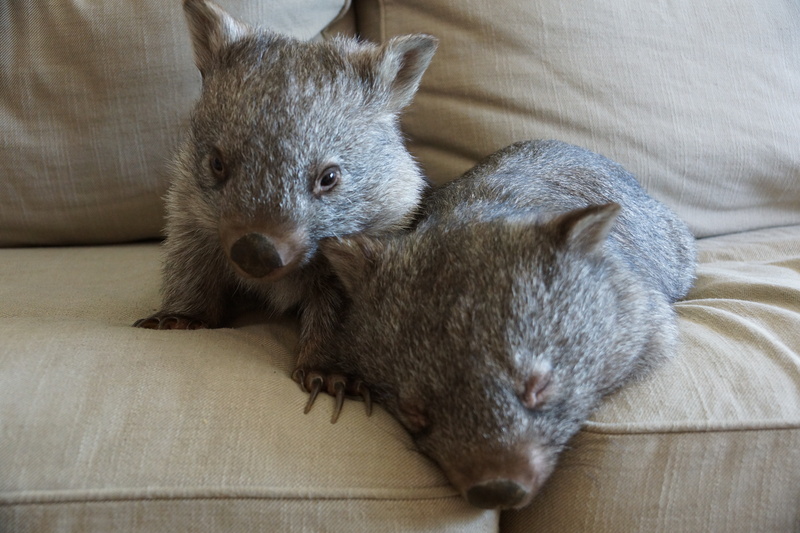 The photos below are of our last two wombats Elvis and Harriet. Many people are curious as to what happens to these animals – so let me share with you what exactly happens. The L.A.O.K.O phone line is managed 24 hours a day by a small group of hard working volunteers. They take many calls from removing snakes around homes, giving assistance to injured wildlife to checking on animals that have been hit by a car. As a member of LAOKO we are called out depending on what our experience is and what courses we have undertaken. Saying that there are many members who choose to only be involved by giving to the organisation financially due to not having the time available for the actual rescues. Eric and I primarily care for orphaned or injured animals and will also go out on site and check injured animals. 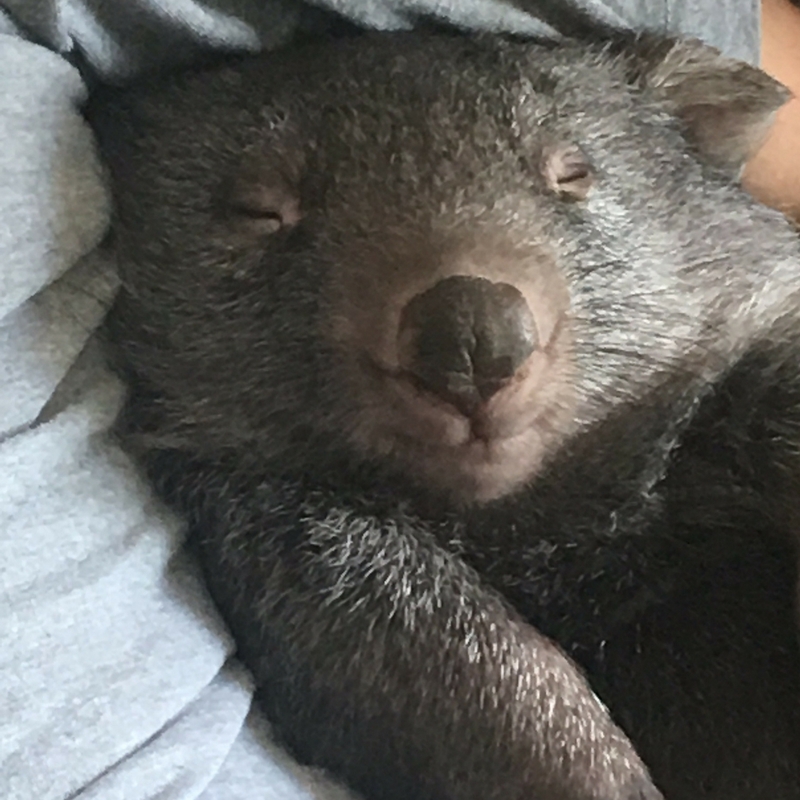 Some of the animals we have given assistance to includes wombats, kangaroos, magpies, lizards and an owl. Most cases we will get a phone call advising us that an animal has been orphaned and needs caring for – then whoever rescued the animal will bring it to us. There are a few animal co-ordinaters who manage the volunteers and know which animals they have and what experience they have. L.A.O.K.O also like to buddy up animals based on animal and age. 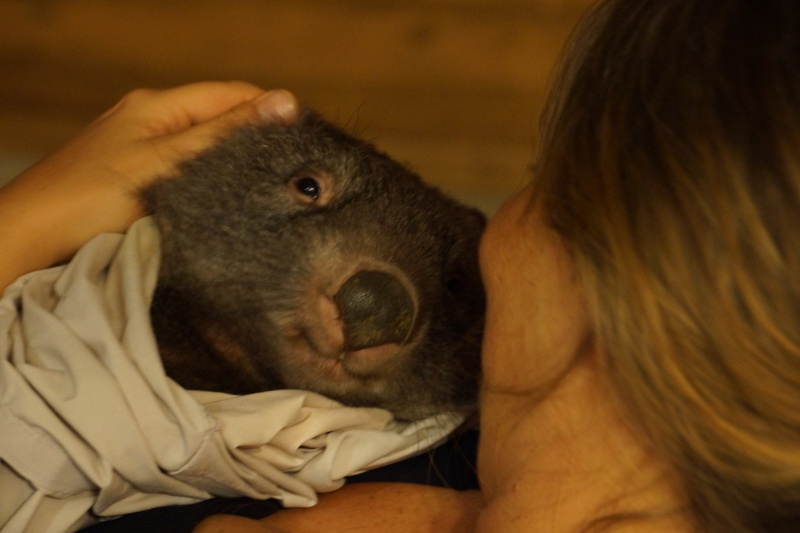 Generally we will only have one wombat for a short time before we get another phone call to take on another wombat of the same age – this is so that they don’t get super attached to humans and learn how to play and interact with animals of their own species. 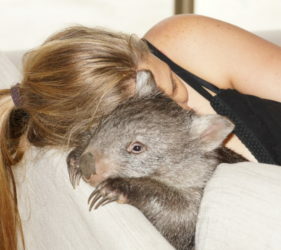 It also makes it more enjoyable for the wombat when it comes to release. If you do hit an animal or spot an injured animal then call LAOKO on (02) 64561313. Even if you hit an animal and it appears to be ok – please still call as many times the animal is in shock and injury won’t be obvious until some time after. 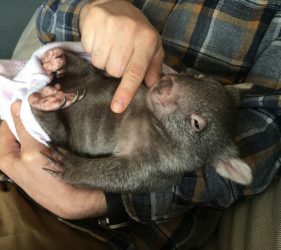 No matter what the situation please call – as it gives the opportunity for someone to come and access the situation and check the animals pouch for a live baby. LAOKO also euthanise any animal that can’t be rescued so that it can be put out of its suffering. Its is very sad the amount of animals hit by cars that lay on the road for hours in suffering and pain – please call. 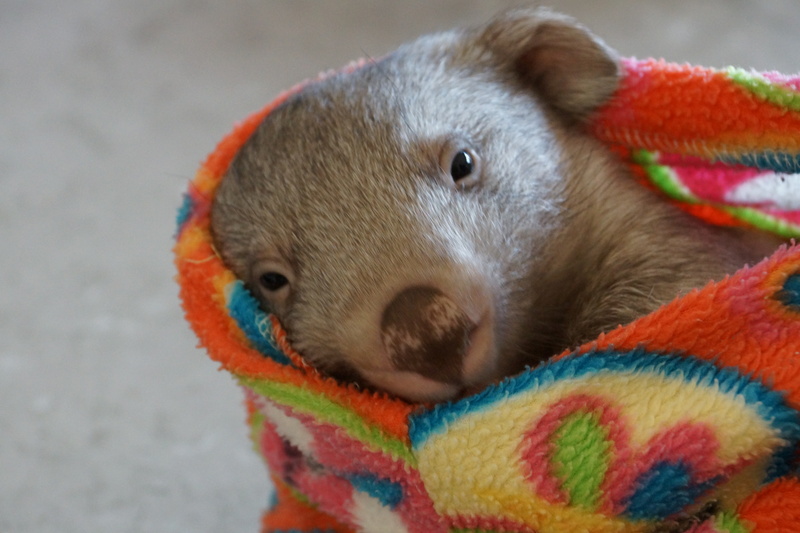 When an orphaned baby wombat first comes into care it is considerable shock as it has just lost its mother – generally from a car. The first thing we do is get it warm and feeling safe. 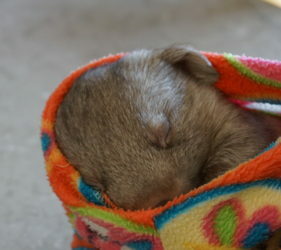 The best way to do this is to swaddle them tightly in a pouch [made from volunteers] and keep it in a quiet and dark place. 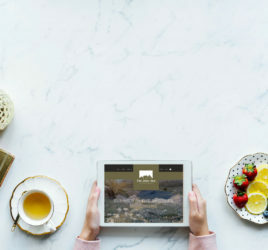 We also need to do a health assessment as soon as we can – this involves checking weight, hydration and doing a body scan for any injury, disease or broken limbs. Any ticks are also removed. 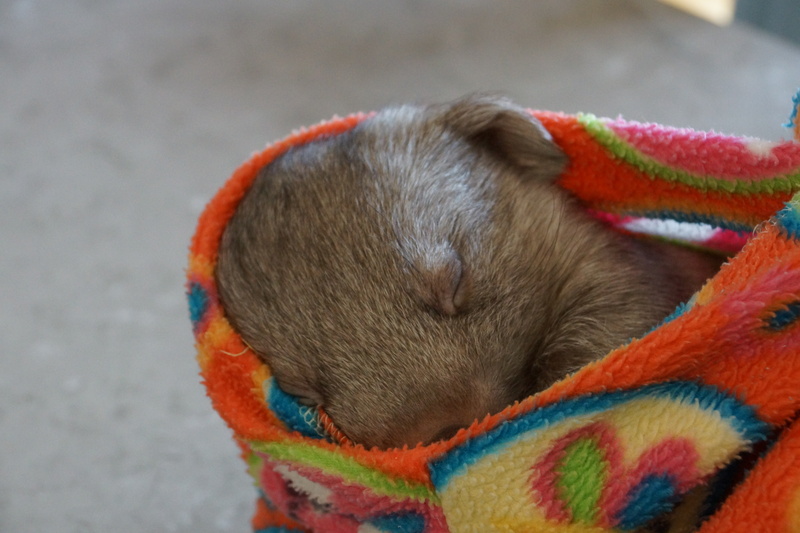 If the baby has no fur then it is important to monitor body temperature as they can’t regulate their own body temperature and often this can lead to death – generally we swaddle them and place them on a heat pad. However, if they have fur then that is one less thing to worry about as they can regulate their own body temperature. After we have let them settle we then try and give them their first bottle. This is extremely time-consuming for most part. The have never had a bottle so they will reject it the first few times. Some will start drinking the milk within the first 24 hours and others will take up to 2 or 3 days. As a carer this can get stressful at times as they need hydration within the first 2 or 3 days for their survival. Often warm water gently syringed into their mouth is a good way to get hydration if they are refusing the bottle. 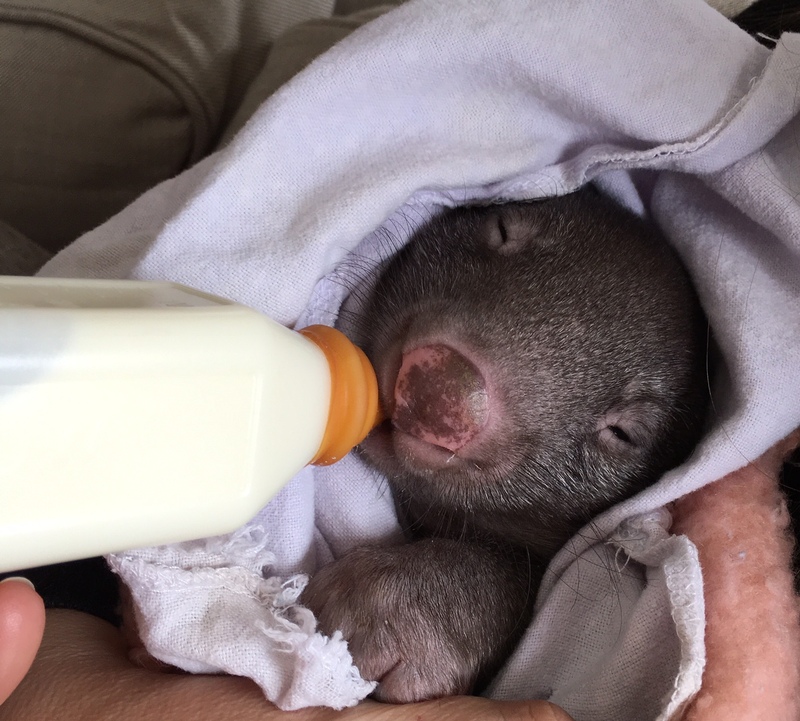 The milk we use is either wombaroo or Biolac – both are designed for marsupials and are dairy free. 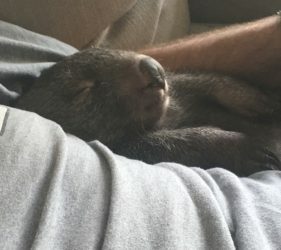 If we don’t have a buddy for the wombat yet we will spend lots of time with it giving it hugs and keeping it close to our heartbeat [they find comfort when laid close to the chest]. 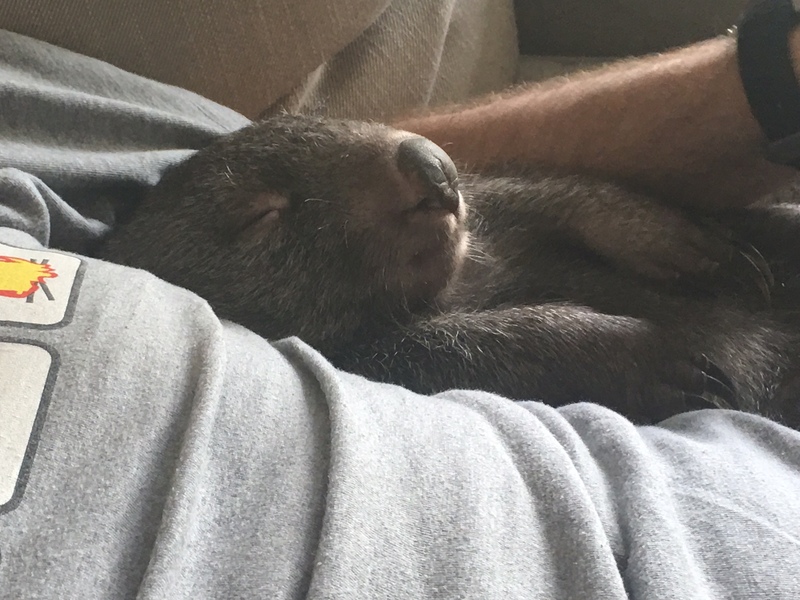 After a week or so the baby wombat starts to get comfortable in its new surrounds and with us. It will start to come out of its pouch and get curious about everything from us, the couch to the throw cushions. Initially they are on 4 bottles a day and over the next 6-8 months we will gradually wean them off. 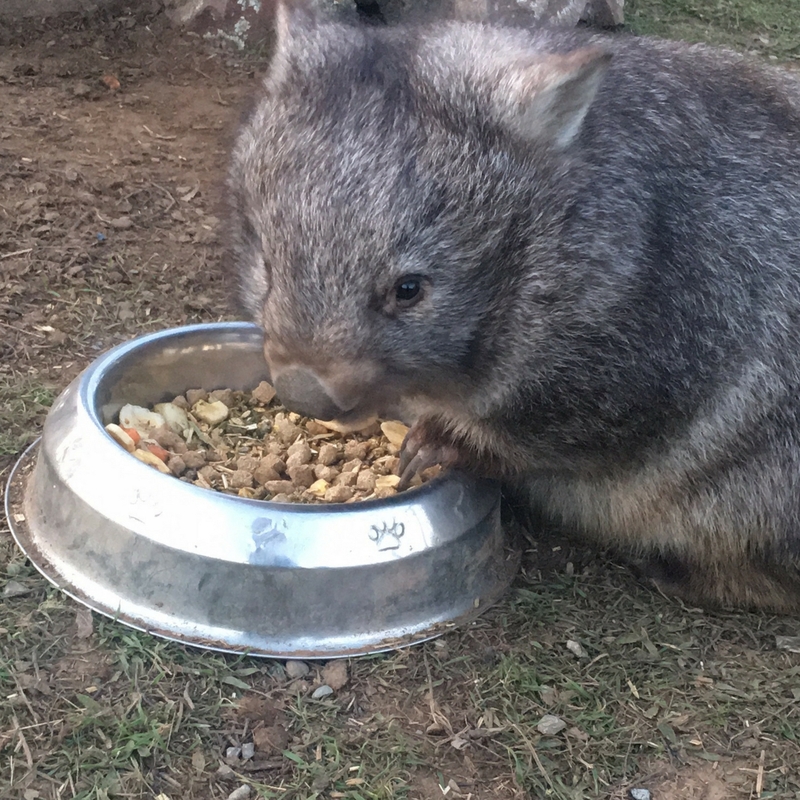 Every week we weigh them to ensure they are gaining weight – a healthy wombat should gain weight. 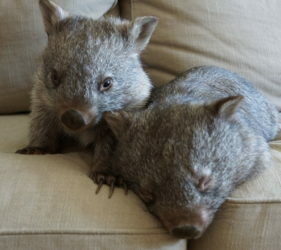 Once we get it buddied up with another wombat they start to play and cuddle together. 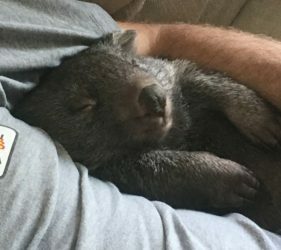 Their little personality starts to show, wombat carers call 2pm the ‘wombat happy hour’ as this is when they wake up and get very playful for an hour or so. They will run around, do little leaps, roll on their backs, play bite and pull shoelaces. 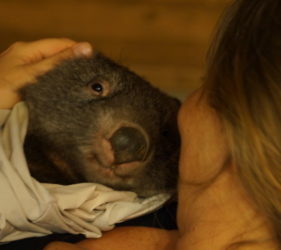 Caring for a wombat is a 2 year commitment. For the first year they live in small enclosures either inside or in the back yard. 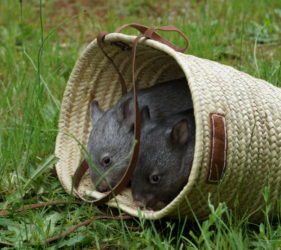 It is important to take them for daily walks and encourage them to dig and eat grass. 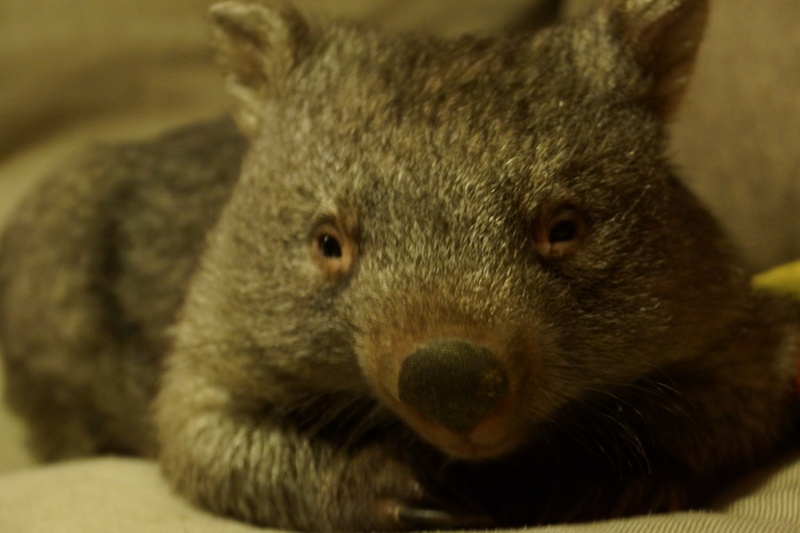 Wombats are both determined and cheeky. They will get into everything. 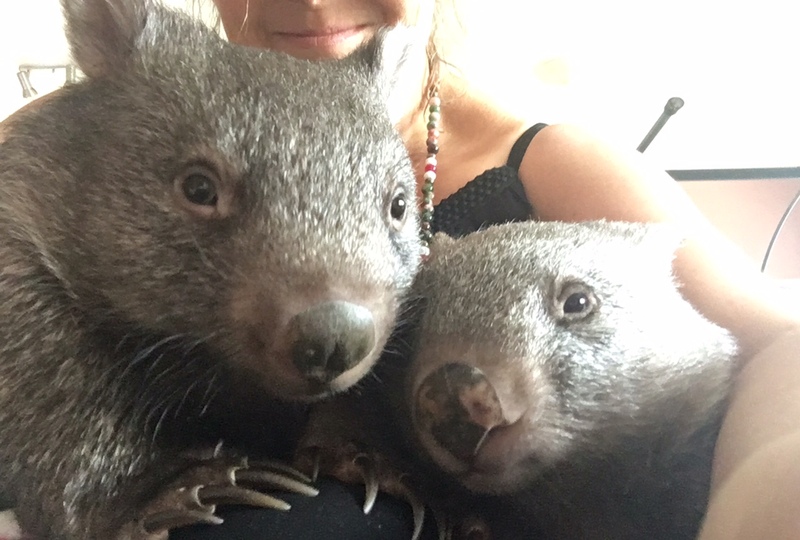 Often at night we would wake up to hear little footsteps running up and down our hallway, only to be faced with two little wombats who have escaped from their indoor enclosure and got into EVERYTHING. I remember one day Harriet was watching me organise my linen cupboard – she was trying to get into it and I wouldn’t let her. Then the next morning I woke up to find she escaped from her enclosure and went straight for the linen cupboard. She managed to open the door and she pulled everything out and had a good play with the pillowcases. I found pillowcases on the couch, in the kitchen and in her enclosure. She was determined to find a way into that linen cupboard. 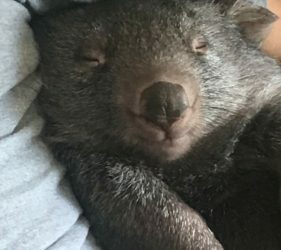 Even though wombats are very bold and cheeky with their carers, they still get nervous very easy around other people which can be detrimental to the wombats well-being. 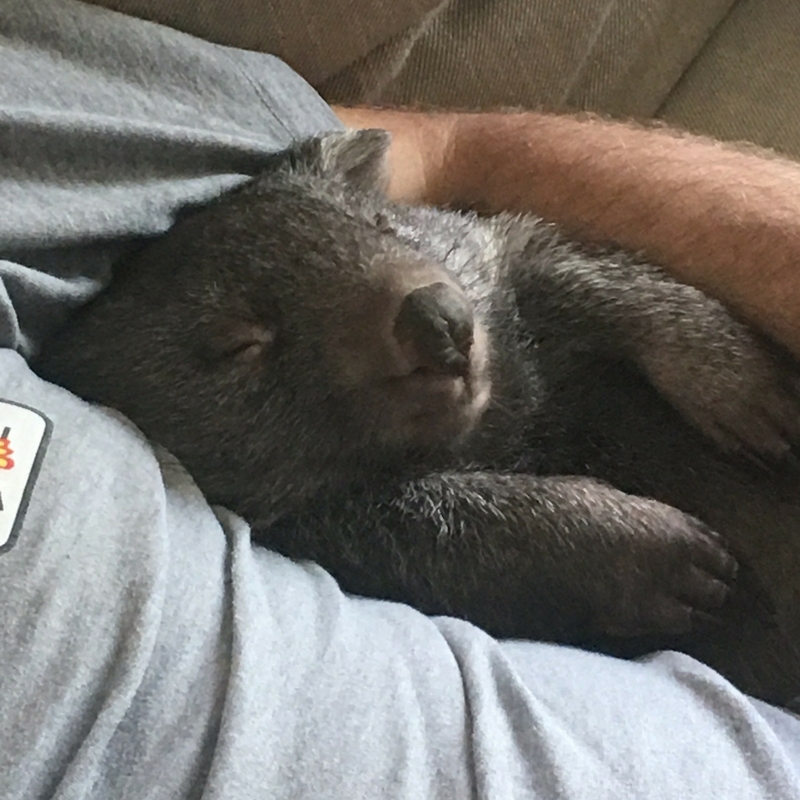 It is not ideal to have wombats exposed to noisy environments, hence why we don’t bring out wombats in the public – only for educational talks when requested. 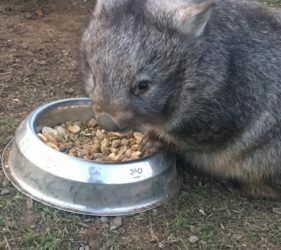 Once the wombats reach 10-12kilos it is time to relocate them to a permanent outdoor enclosure to enable them to get ready for release. 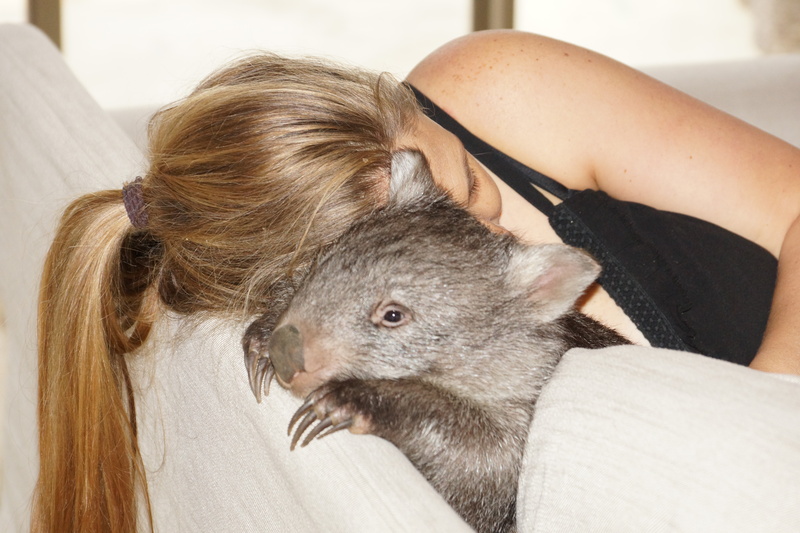 While the wombats adapt quite easily to the change us humans tend to miss having them around all the time. They will generally spend up to a year in this enclosure. 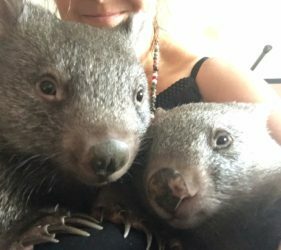 Elvis and Harriet are currently in wombat heaven – they have been relocated to a beautiful property that is far away from any roads. Eric and I go out and visit them every 3 or 4 weeks – and they are super excited to see us which is super sweet. Over the next 8 months the gates will open to the enclosure and they will be free to come and go as they please. Eventually once they feel comfortable to be on their own they will stay in the wild. 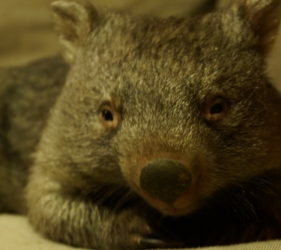 Even though they leave their enclosure many raised wombats will still drop in for a visit every few weeks or so. Some even bring around their babies. 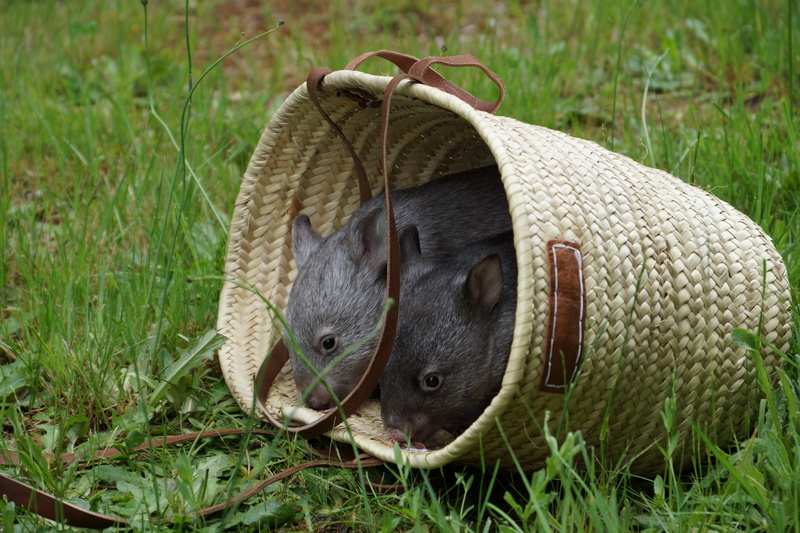 There are several ways you can help us help our native animals. Your help and support gives animals a second chance.